But of most immediate concern is the prospect of large scale housing developments. We will keep you informed of proposals and what you can do about it on this site. 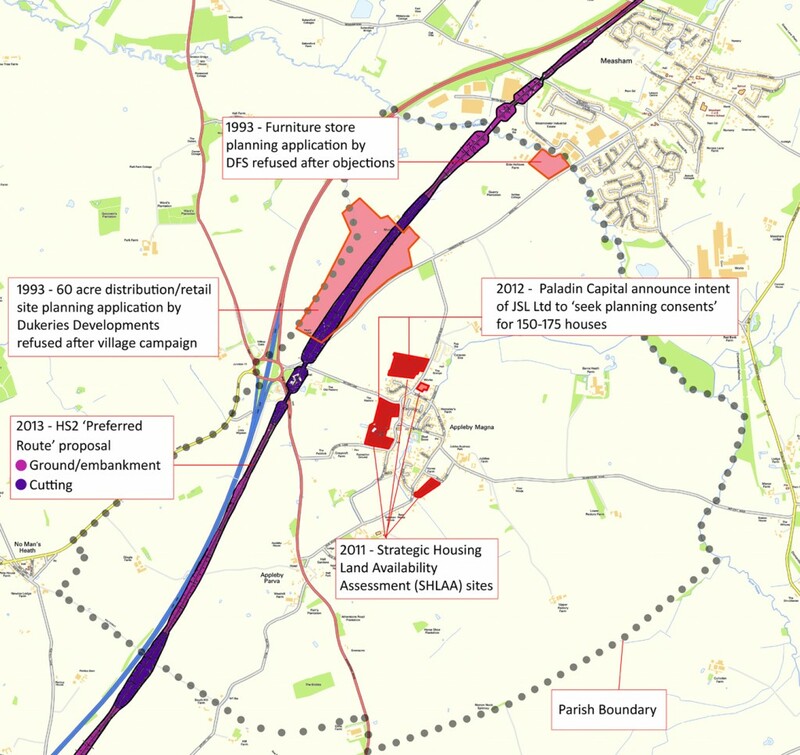 Developers threatened all the countryside around the motorway junction and to reduce the open countryside between Measham and Appleby with plans for shops and warehouses – these were largely defeated with massive support from Appleby residents. Limited change to the village – mostly sympathetically designed and sited. The Village Design Statement, created by village residents in 1999, helped to ensure this. What will the next 10 – 15 years bring? A developer wants to build between 150 and 175 houses all on land outside the village boundary. Appleby currently has less than 500 houses. Half of these proposed houses would be behind the Church Hall, next to historic buildings and the Conservation Area, the others on Measham Road. All bringing more traffic to village roads and pressure on services. HS2 rail link is planned to come the Appleby side of the motorway, through the hotel, the top of Rectory Lane and passing very close to the Old Rectory. Local and National planning policy (used to judge new applications) is changing. It generally favours more development. Our Village Design Statement will only continue to be effective if it is updated and reflects current residents’ views. Appleby is an attractive rural village with clear boundaries and a balance of different types of housing. Let’s keep it that way!